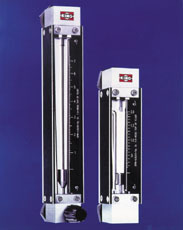 The 7450 Series from King Instrument Co., of Garden Grove, Calif., features 75 mm and 150 mm scale borosilicate glass tube flow meters. Capacities range from 0.5 to 7.4 gpm water, and 2 to 20 SCFM air. They’re made of anodized aluminum or 316SS side plate construction. Polycarbonate shields come on the front and back. The wetted parts are 316 stainless steel (PVC/Hastelloy 276C optional). Plumbing connections of 3/8” NPT are standard. A flow control valve is optional.